Tree Share (full tree read and write) - Certified to read and write Family Tree data to match, compare, and modify records. Also includes required certification for sources, discussions, change history, and interaction with community members. Sources Certified to read Family Tree data allowing user to match and reference online "sources' such as records, photos, documents, and media that provide evidence of events and relationships. Discussions Certified to read, write, and comment on discussion threads for individual records in Family Tree. Change History Certified to read and list changes made by contributors to the Family Tree, sources, and discussions. LDS Support Certified that specific data and features for 'LDS members only' can only be accessed when the user is appropriately logged in to FamilySearch. Tree Access Certification is necessary for reading ordinance information, Tree Share Certification is necessary for requesting, changing, sharing, and printing Family Ordinance Requests (FORs). Personal Ancestral File (PAF) Compatibility Certified to import PAF data files. Ancestral Quest goes a step further, and is the ONLY desktop family tree software to actually use a PAF database just as PAF does, so that no import is necessary. Memories Write Certified to add and maintain photos, stories and other documents. FamilySearch Hinting Certified to read and display hints from FamilySearch. Ancestral Quest was the first desktop family tree program to be certified to access, update and sync with FamilySearch's online databases, and is currently certified to share and collaborate with Family Tree. AQ has met the rigorous standards set by FamilySearch to be certified for Tree Share, Sources, Discussions, Change History and LDS Support. (See panel to left for details.) 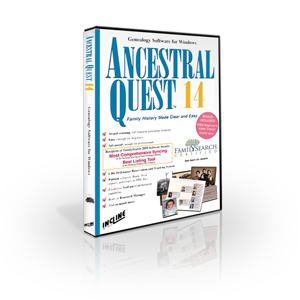 No other software has received more certifications than Ancestral Quest. Going above and beyond the FamilySearch certification requirements, Ancestral Quest is the only1 family tree desktop app to allow you to correct improperly linked families in FamilySearch Family Tree. You can unlink children from families when they have been improperly linked, and you can separate improperly linked couples, even when children are linked to them. Ancestral Quest allows you to view notes from both your personal file and the records of Family Tree. Whether you store most of your documentation in Notes or in Sources, AQ will allow you to transfer that documentation to Family Tree. AQ is the first Tree Share certified program to allow you to exchange notes between your file and Family Tree, and is the only1 Tree Share certified program to adhere to the collaboration standards set for other data when working with notes in Family Tree. In addition to meeting the requirements for FamilySearch Sources certification, Ancestral Quest provides exacting genealogists with an extra bonus. In most desktop family tree programs, sources are recorded with such details as the source Title, Author, Publication Facts, Repository, Page Number, Source Quality, etc. In Family Tree, sources provide this information as a formatted 'citation', but do not contain the detailed breakdown of this data. AQ allows users to send the breakdown of these details to Family Tree to be stored in the Notes portion of the Family Tree source. This allows other users of a desktop program to later import the source in such a way that the Title, Author, Repository, etc., are properly brought back from Family Tree. Ancestral Quest is the only1 full-featured family tree program which is both Tree Share certified by FamilySearch and can share data between Family Tree and a PAF 5 file.